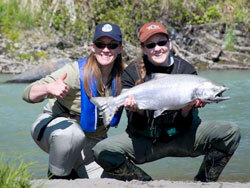 Alaska Department of Fish & Game and the Hunter Information & Training Program, (HIT) work closely with partner conservation groups to bring a variety of outdoor workshops and activities to Alaska, specifically for women. These programs provide an opportunity for women to experience a wide variety of outdoor activities. All activities are taught by certified, volunteer instructors with two main goals in mind; being safe and having fun. Each of our women’s programs offer a variety of learning experiences, some in the classroom and many being held outdoors with plenty of “hands-on” activities. The future of our hunting heritage is so dependent on the ability of families getting outdoors to enjoy all that is available. By offering these basic skills to the women in our communities, we are providing a basic level of understanding and competence, encouraging them to participate with their families in healthy, outdoor activities. Becoming an Outdoors Woman (BOW) is a national program that offers outdoor skills workshops to women. These workshops are normally held on a weekend with lodging and meals provided. Attendees will make choices on the clinics they wish to attend during the weekend. Each session will run approximately 2-3 hours, providing very detailed information and experience.